What Makes Coconut Oil A Must-Have In Your Pantry? Hey there! I’m Lisa Danielson, a certified personal trainer and ISSA Specialist in Fitness Nutrition. I’m also known as “Veggie Lisa” because I’m a vegetarian and absolutely LOVE veggies! I’ve helped hundreds of individuals learn how to eat better and reach their health and fitness goals. I have four kids who are still learning to love veggies as much as I do, so having healthy products to cook with gives me a little peace of mind. I believe that what you cook your food in matters just as much as the food you're cooking. Having a healthy foundation in your meals will help you choose healthier options as you go. IdealRaw Organic Coconut Oil delivers healthy fats to my body so I can have the energy and endurance I need to keep up with my daily activities. I use it as a healthy base in all my meals and smoothies! You can use our coconut oil for SO many things! Swap it out for a healthy cooking alternative to butter, or moisturize your face and skin with it. Whatever you plan on using it for, we know you're going to LOVE it as much as we do! 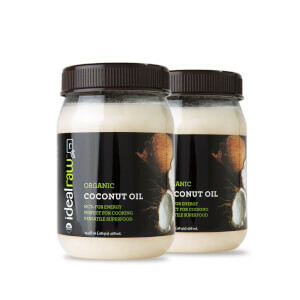 Save on IdealRaw Organic Coconut Oil Today! Looking For An All-In-One Healthy Cooking Alternative? We've got just what you need. IdealRaw Organic Coconut Oil has no limits when it comes to use. It contains healthy fats that can be broken down by the body much more efficiently than other fats, which makes it great for cooking. It can also be used as an all natural beauty product to improve your hair, mouth, and skin health. Can I View The Nutrition Facts and Ingredient List? 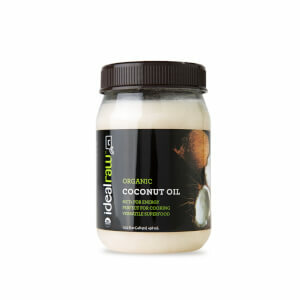 IdealRaw Organic Coconut Oil contains only one ingredient, Organic Coconut Oil! How do I bake with IdealRaw Coconut Oil? Replace 1 part shortening with 3/4 part coconut oil. Coconut oil has been known to work better when the rest of your ingredients are somewhere around room temperature. It makes a great replacement for less healthy alternatives like vegetable oils. Melt coconut oil and use it in its liquid state to replace vegetable oil. How do I cook with IdealRaw Coconut Oil? Does IdealRaw Coconut Oil need to be refrigerated? No, coconut oil does not need to be refrigerated. If you put coconut oil in the refrigerator, it becomes very hard. What is the shelf life of IdealRaw Coconut Oil? There are small specks in the bottom of my IdealRaw Coconut Oil. What are they? They are little coconut fibers. Perfectly normal. Can I use coconut oil for my skin and hair? Yes! You can try putting a few tablespoons into your hair before a bath or shower. You can also use coconut oil as a lotion. Since coconut oil melts at 76°F, it absorbs easily and leaves your skin smooth, with a light, clean coconut scent. Many massage therapists report that it helps to reduce the appearance of stretch marks. My IdealRaw Coconut Oil is now liquid. It was solid when I bought it at the store. Is it still okay? Yes, this is just fine. Coconut oil melts somewhere around 76°F. Any cooler than this, it turns to a solid; above, it is a liquid. 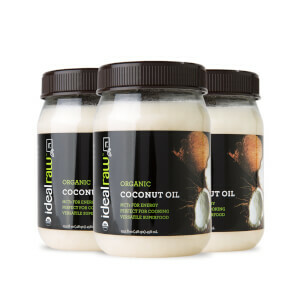 We are sure you'll love IdealRaw Organic Coconut Oil. If you don’t, send it back within 1 year for a full product price refund. No hassle and no questions asked. It's that simple!